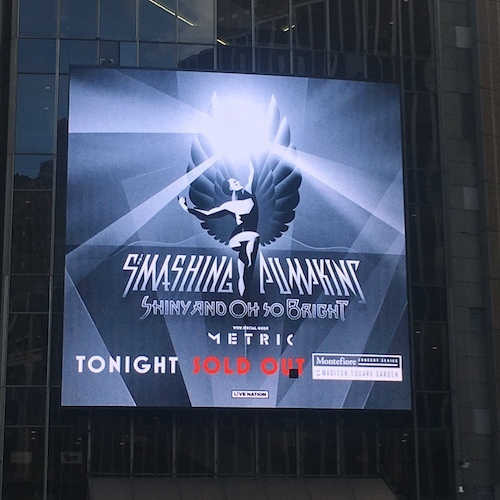 The Smashing Pumpkins reunion tour finally rolled into New York last night. It wasn’t a complete original lineup reunion because bass player D’arcy Wretzky still has extreme beef with Billy Corgan that doesn’t look to ever be resolved. Be that as it may, getting guitarist James Iha, drummer Jimmy Chamberlain and Billy Corgan on stage this summer for the first time since 2000 is a milestone event for the band and all their fans from their 90s heyday. This was my first proper time seeing the Pumpkins. I had previous seen the short lived Zwan fronted by Corgan at the Y100 Christmas music festival back in 2002. That band was good, not great and left you wanting more. A lot more. Over the years I also turned down many opportunities to see the Pumpkins when it was full of replacement players, sometimes Jimmy on drums but always Billy at the front. Those lineups and incarnations of the band had no magic or spark. Just a revolving door of sidemen. It was Smashing Pumpkins in name only. It felt like a cash grab with an established rock brand to hide behind. I wanted to see the real thing. I wanted my 90s Pumpkins back for one more night of glory. Well I’m happy to report that Thursday night I got exactly that, vintage, raw and loud Smashing Pumpkins. The setlist ran 3 hours plus, featured classics from their first 5 albums (plus new single “Solora”). There really weren’t too many opportunities to catch your breath, grab another beer or make a bathroom break. The hits just kept on coming. One after another like a never ending invasion of mid 90s alt rock radio staples: “Disarm”, “Today”, “Cherub Rock”, “Zero”, “Tonight Tonight”, “1979” and “Bullet With Butterfly Wings”. It was like Guitar Hero on steroids. Monster guitar solos, big drums and Corgan sounding exactly like he did 25 years ago. I was highly impressed with how unchanged his voice sounds after all these years. The Pumpkins also played a diverse array of cover songs “Space Oddity”, “Landslide”, “Stairway To Heaven” and “Baby Mine”. The best cover being David Bowie’s “Space Oddity” with a full on glam rock interpretation. A clear highlight of the show and it suited Billy’s voice quite well. It was interesting to hear “Stairway To Heaven” live since not many of us caught Led Zeppelin live but the song felt very rushed and carefree. I’d have preferred more original Pumpkins material. Songs like “I Am One”, “Ugly” or even “Perfect”. With an enormous back catalogue why play any covers at all? Besides the big hit singles that were played, it was a pleasure to have the chance to hear some deeper cuts I never imagined I would hear live (“Eye”, “For Martha”, “The Beginning Is the End Is the Beginning”, “Soma”). Glad James Iha got a chance to shine by singing leads vocals on “Blew Away”. There were definitely some odd ball moments throughout the night. I’m pretty sure Corgan started the night in a dress or maybe it was a kilt. Either way it looked strange and unflattering. The giant video monitor behind the stage showed mostly images and videos of Billy (a solid 95%) with some random shots of James and Jimmy. No traces of D’arcy. The video interludes were also puzzling. Mark McGraph of Sugar Ray fame involved in two of them. I would love to know the connection between the Pumpkins and Mark McGraph. Two polar opposite bands from the 90s for sure. Maybe he’s just a really really big fan like the rest of us? Who knows. At one point during the show a religious shrine of some sort was paraded around the seating area on the floor. No idea what that was supposed to signify. It was never explained or acknowledged by the band. Speaking of that, the Pumpkins had very few words for the crowd all evening long. I expected more banter, especially from Billy. That guy loves to talk and he had 18,000 open ears. The band didn’t really stick the ending like I wish they would have. The encore was a whimper. The new single “Solara” is just a standard loud rocker. It feels more like a Smashing Pumpkins song from 2007-2013 than the 90s version of the group. Also ending the overall show with “Baby Mine” from the film Dumbo was a peculiar choice. So many fans flooded for the exits. They really should have concluded the night with one of their biggest hits, a song like “Today”, “Tonight Tonight” or “1979”. Send the people home in their happiest state. Previous Radiohead Are Happy To Serve You….